This book is for those who want to find some activity that's relaxing to do and don't want to be too worried about the result. 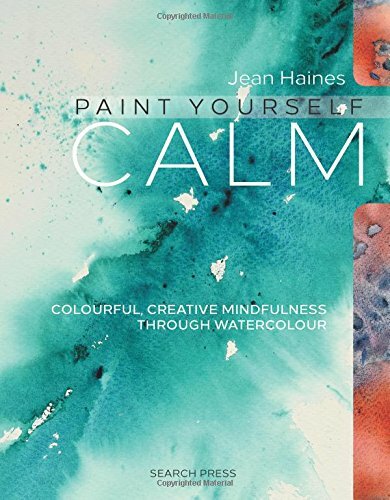 It's a book that wants to you to enjoy the therapeutic effect of painting. Personally, I do find it relaxing, enjoyable and fun to just play around with watercolour, to watch the vibrant colours spread on the paper. That's why I enjoy using watercolour. This book is for beginners. It's not an introductory book to watercolour but it does teaches you different techniques that you can use to create your own beautiful washes. Most of the exercises are on creating washes, blending colours, creating special effects. If you're an intermediate or advanced artist, there's nothing new to the techniques featured. For beginners with no prior knowledge, I guess it can be quite fun to follow the lessons, to see how the colours can work together, or even work on its own. The few subjects used as examples for painting are flowers, but even so the drawings are extremely loose. There are many pages where those washes are used as background upon which text are laid over. This book has lots of favourable reviews on Amazon. So I guess there is a market for people who just want to dabble with watercolours or want a relaxing hobby. If you're that person, then this book is for you. i'm actually in love with this book. jean haines very obviously loves the medium and the exercises in the book made me feel like i can do it, too; paint with watercolours. loads of books start with how difficult it is to paint with watercolour and that might be true but as a beginner you don't know anything. and the thing haines teaches in this book is how to start. how not to be afraid. i love her for that. this book isn't a perfect introduction, sure, but for me it definitely was.